How Does Water Become ‘Hard’? 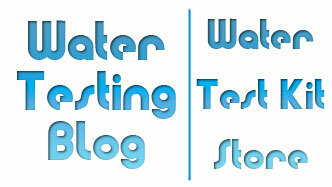 posted by Water Testing Blog on Tuesday, November 6th 2012 under: Hardness, Home Water Testing, Water Quality Testing, Water Softener, Water Test Kit, Water Testing Tags: calcium hardness, hard water, how does water become hard?, test for water hardness, water hardness, what makes water hard? As more and more people begin taking an interest in the quality of their drinking water, more and more people have started asking not only WHAT their water contains (besides 2 hydrogen molecules and 1 oxygen molecule), but also WHY their water contains things other than it ought to. With that said, today’s inquiry came to us from ‘Cass’, a concerned woman from North Carolina with concern over the origin of high hardness in her drinking water. Hi. Can you explain why water has hardness in when it when it comes out of a well? If rain water becomes well water wehere does the hardness come from? Shouldn’t the water just be water? Thank you for the question, Cass. When droplets of rain water form in the atmosphere they contain nothing but good old hydrogen and oxygen with no dissolved minerals. In that state the water has a tendency to react with pretty much any and everything it comes in contact with and our atmosphere contains quite a bit of carbon dioxide. As the water mingles with atmospheric carbon dioxide a weak acid (carbonic acid) forms. That acid makes the water slightly more aggressive and once the water reaches the ground it then filters down through soil, rock, bedrock, etc. where it has a chance to dissolve and then absorb tiny amounts of each of those materials. The more aggressive the water becomes on its trip down through the atmosphere and/or the more contact the water has with the ground as it makes its way through the Earth and into an aquifer, the more dissolved minerals (i.e. calcium, magnesium, metals, etc.) the water will contain when pulled up by a well for use in one’s home. While wet chemistry titration test kits have provided reliable water test results for many years they do not have the same monopoly on accuracy, reliability, affordability and ease of use that test strips such as WaterWorks Total Hardness possesses. 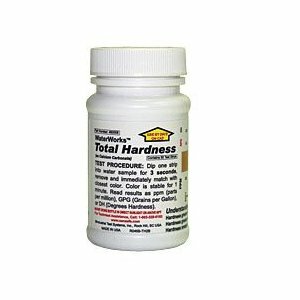 The WaterWorks Total Hardness test strips allow interested parties to perform total hardness in water testing in under 15 seconds and get results they can depend on each time. 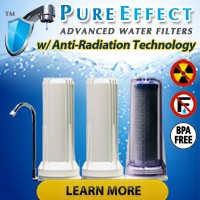 Too much dissolved calcium (or magnesium) in water can result in increased soap/detergent consumption for washing machines and dishwashers, lackluster performance of shampoos & conditioners, dry skin, dish (water) spots, bathtub rings, clogged plumbing, and a host of other problems — some of which cost a lot of money to fix! For more information on the effects of hardness (dissolved calcium & magnesium) in water and/or how to soften, treat or otherwise condition hard water, please check out the articles in Water Testing Blog’s Hardness Archives and Water Softener Archives. Water Softener That Does Not Use Salt? What Should You Test if You Have City/Municipal Water?